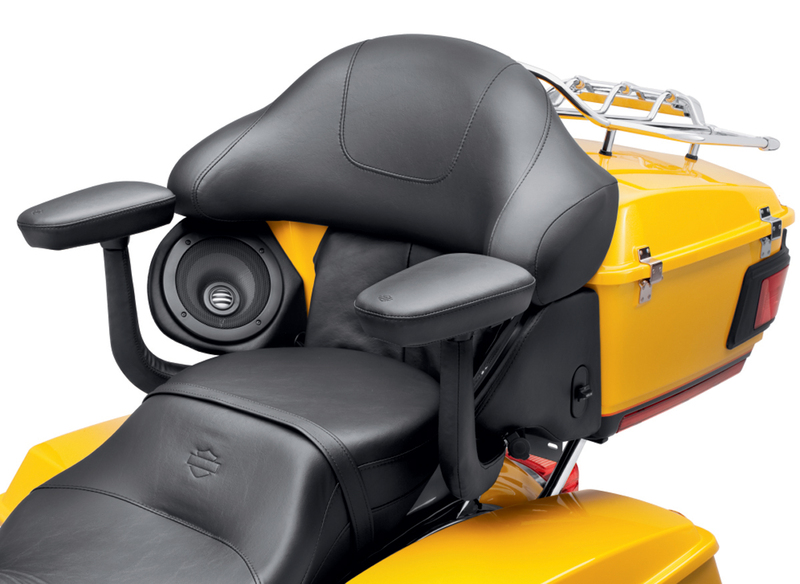 MILWAUKEE - The new Tour-Pak® Passenger Armrests (P/N 52400074, $399.95) from Harley-Davidson® Genuine Motor Accessories® are ergonomically designed to provide the ultimate in passenger comfort. The soft pads are upholstered in black vinyl and provide excellent forearm support on a long ride. Both armrests swing away for easy mounting and dismounting, and the pads and arms can be oriented in multiple positions. The armrest pads feature spring-loaded hinged storage compartments that can hold compact personal items. The Passenger Armrests are designed to blend with Original Equipment seats and speaker pods. The complete kit includes all required installation hardware and fits 2009-later Touring models equipped with hard Tour-Pak® Luggage (except CVO™ and Trike models), and fits with Detachable Tour-Pak® Mounting racks.